While the possessed Superman tackles his friends, more of the heroes and villains begin succumbing to the evil influence of the Pits' magic. 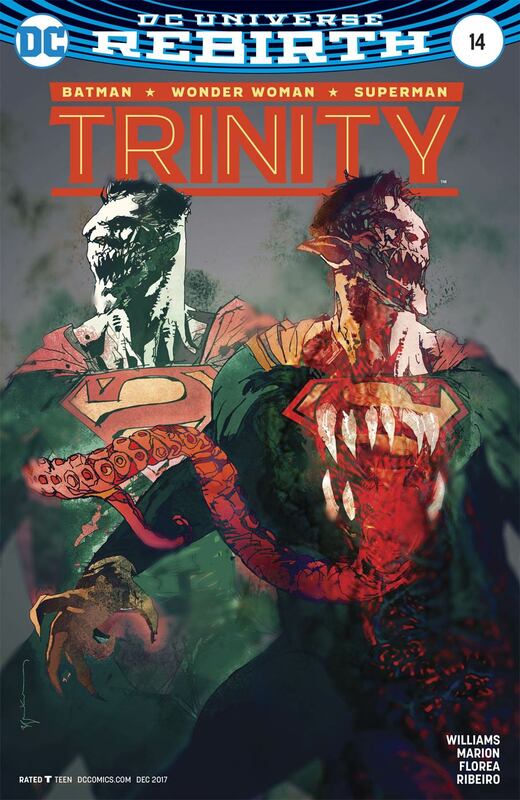 They all start sprouting fangs and Superman now looks particularly gruesome. Circe and her true motivation for using the Pandora Pits comes to light and it seems both Ra's and Lex were pawns in her ploy. Story - 1: End it. This is not the same story that began months ago. The revelation of Circe's plan has spoilt it for me. The story has become something entirely different and that is deeply annoying for a reader. The book made promises in the writing that are no longer being delivered. Remember how you were so excited by the DC/Marvel Crossovers that started out great and then unravelled into... nothing? That is what this 'Dark Trinity' story has devolved into. Maybe next issue we'll get Ra's Al Ghul and Lex returning to put this back on track. Sadly, I doubt it. Art - 3: The art is frenetic and full of energy. The kind of art John Carpenter would be drooling over if he were to do another 'The Thing' movie. I know it is magic and turning Superman into a slobbering beast is a shocking visual, but why is he warped so much compared to the others? Marion is frantically trying to keep your interest with arresting scenes to make up for the writing, but the art just isn't strong enough to do so. Cover Art - 3: I feel odd saying this about a Daniel cover but, Meh. This isn't influenced by that awful anniversary variant by the way. There is just no atmosphere, no thrill, no sense of action. I don't think it's the art, I think it's the coloring and the decision to place the line work against a dull backdrop. 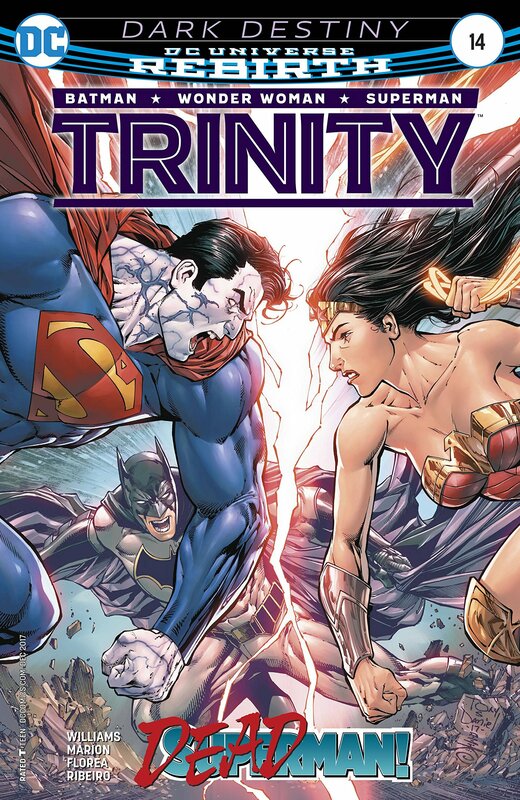 I also thought this was Diana versus Bizarro for a moment, he looks nothing like the bewitched Clark inside the book. A little continuity would have perhaps helped as Demonic Superman versus Wonder Woman & Batman definitely would have caught my attention. Variant Cover Art - 5: Two warped Supermen. Sienkiewicz does a great job of emphasizing the supernatural, macabre side to the story. There is tonnes more atmosphere in this piece of art compared to the direct cover. This speaks to me in ways the direct cover simply cannot.